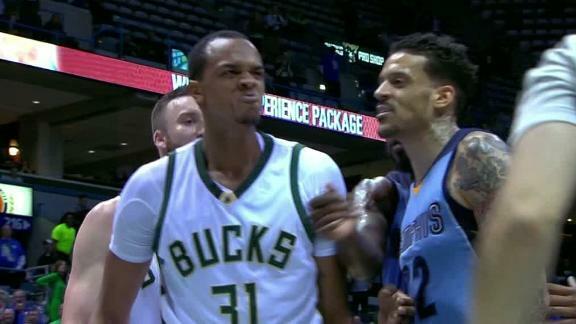 The Milwaukee Bucks had Thursday night's game against the visitingMemphis Grizzlieswell in hand during the last seconds of the fourth quarter when John Henson put on his best tough-guy face -- and was ejected. Henson, the Bucks' reserve forward, was quickly pushed away by referee Marc Davis after blocking Matt Barnes' layup and turning to stare at the Grizzlies forward with 5.5 seconds left to play in Milwaukee's 96-86 victory. Barnes argued back with Henson, and the two were slapped with a double technical upon review. Henson was thrown out of the game with his second technical. Henson, briefly pacing while sporting his best-staged frown and clenched fists, left the court with his arms above his head, egging on the raucous crowd. He then tossed his jersey into the stands, making the little child it landed on one happy fan. "That's not the type of kid that John is," Memphis center Ryan Hollins said. "He's a really great kid, a shot-blocker. I thought he played great tonight. So maybe it was just those emotions coming out. That's not his personality. Hopefully no one loses any money over something that silly." Barnes was subbed out and left the court, walking down the same concourse to the visitors locker room.Barnes was later listed as ejected on the scoresheet. The game had grown testy earlier in the fourth when Henson came up behind Grizzlies forward Lance Stephenson, who had just grabbed a rebound. Henson swiped the ball away and in the process dumped Stephenson to the floor. After a review, Henson, who finished with three points and four blocked shots, was called for a flagrant foul 1 and a technical. Barnes made the technical and Stephenson made two free throws that pulled Memphis to 88-83 with 3:43 left in the game. With 0.5 seconds remaining, John Henson swats Matt Barnes' shot into the stands, firing up both Barnes and Henson who receive technicals and are ejected. Barnes appears to chase a taunting Henson down the tunnel.